Inspired by a story in the Daily Mail about a teenage runaway, She's Leaving Home was described by George Martin as "not, strictly speaking, a Beatles song at all," and "pure McCartney, from start to finish". In February 1967 McCartney read about Melanie Coe, a 17-year-old A-level schoolgirl from Stamford Hill, north London. 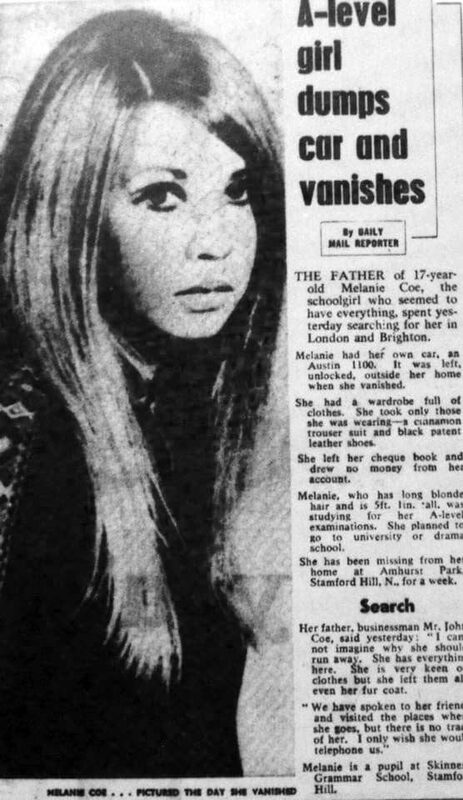 She went missing without her car, cheque book and spare clothes. Her father was quoted as saying, "I cannot imagine why she should run away. She has everything here." Coe briefly rented a flat in Paddington with a croupier she had met in a nightclub, and returned home around 10 days after the newspaper report was published. McCartney wrote the music and the initial lyrics, which were later completed with John Lennon. The amazing thing about the song was how much it got right about my life. It quoted the parents as saying 'We gave her everything money can buy,' which was true in my case. I had two diamond rings, a mink coat, handmade clothes in silk and cashmere and even my own car. I heard the song when it came out and thought it was about someone like me but never dreamed it was actually about me. I can remember thinking that I didn't run off with a man from the motor trade, so it couldn't have been me! I must have been in my twenties when my mother said she'd seen Paul on television and he'd said that the song was based on a story in a newspaper. That's when I started telling my friends it was about me. Coincidentally, Coe had met The Beatles some time before. On 4 October 1963 she won a miming competition on the TV music show Ready Steady Go. The Beatles were making their first appearance on the show that day, and Paul McCartney presented her with the award. I spent that day in the studios going through rehearsals, so I was around The Beatles most of that time. Paul wasn't particularly chatty and John seemed distant but I did spend time talking to George and Ringo. The 'man from the motor trade' in She's Leaving Home was taken by some to be Terry Doran, Brian Epstein's partner in Brydor Cars, an automobile company operating from Hounslow. Others took it as a euphemism for an abortionist. In fact it was neither of these. It was just fiction, like the sea captain in Yellow Submarine; they weren't real people. The man from the motor trade was just a typical sleazy characer, the kind of guy that could pull a young bird by saying, 'Would you like a ride in my car, darlin'?' Nice plush interior, that's how you pulled birds. So it was just a nice little bit of sleaze. Like Eleanor Rigby before it, She's Leaving Home did not feature any musical instruments played by The Beatles. Instead it had a string backing, with a harp, violins, violas, cellos and a double bass. It was scored by Mike Leander, a freelance producer and arranger, because George Martin was unavailable at the short notice demanded by McCartney. George Martin saw McCartney's actions as a slight and was very hurt, although he did produce the session and conduct the players. I couldn't understand why he was so impatient all of a sudden. It obviously hadn't occurred to him that I would be upset. Recording took place over two days. The first was on 17 March 1967, which featured just the strings. Six takes were recorded; Paul McCartney was present in the studio. I got to the studio early to tune the instrument. I walked in and there was Paul McCartney but I didn't recognise him at first. I was concentrating on what was written on the manuscript, then I turned around, heard the Liverpool accent and realised it was him. I hadn't got a clue, I had just talked to the other musicians and waited. In actual fact he was quite difficult to work with because he wasn't too sure what he actually wanted. He said 'no I don't want that, I want something...' but he couldn't describe what he wanted and I tried it all every which way. On 20 March it was decided that take one had been the best, and so Paul and John's vocals were recorded, twice over to give the impression of more voices. This song is actually a proper Lennon-McCartney composition although not generally acknowledged as such. I believe that what Sir George Martin meant by « Pure McCartney » was in the song’s essence not in writing contribution strictly speaking. 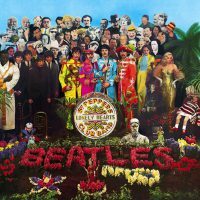 It does reflect a stronger ( if not total ) McCartney feel… Of course, John contributed — as stated by Paul himself — with his very Lennonesque « Greek chorus » lines. Nonetheless, it was still created from Paul’s inspiration and very much reflects his brand and that’s what Martin was making reference to in his comment. I think you are right. A pure collaboration, Paul’s verse John’s chorus. And if you think about the verse and chorus lyrics, they must have done them together, at least the second and third verse. Verses and refrains are so linked, that they must have thought them together. If you think about the end result, in my opinion it’s not possible that Paul came with three full verses, and after that John wrote those refrain lyrics. In fact, you can see in Lennon’s handwritten lyrics for Lucy In The Sky With Diamonds, that he was maybe also thinking words for the third verse for She’s Leaving Home in that same paper. You can see he has written “Wedenesday morning at 9… ” . I think Martin was stating that the lyrics and songwriting are pure McCartney. The song ties strongly with Paul’s recurring theme of alienation seen in Revolver (the album just before Sgt. Pepper). Elanor Rigby and For No One have similar messages of separation. Though it is true that Lennon provides a great counter-melody musically, the song is definitely a classic McCartney tune in its meaning. paul wrote the part with the high extend notes(she … is… leaving… home). lennon’s contribution was the countermelody and the lyrics from the father and mother part(we gave her most our lives…). David Crosby didn’t sing on this song for sure!! Maybe they did their own version? Isn’t there also George Harrison in backing vocals? I believe its just Paul and John doing backround vocals in the format that is described in the aforementioned comments. I think Paul and John sat across from one another in the studio and recorded thier parts at the same time. Sorry no George on this one. I just listened to this song in both mono and stereo versions; there is a slight difference between the two tracks. One is either speeded up or the other one is a lower pitch or something; it’s hard to pinpoint since I was listening on my laptop. This is song is stunning. Haunting. Alluring beauty. John’s (fantastic!) incredibly sweet voice in the “Greek chorus” gives you shivers. More so than in A Day in the Lifeâ€¦ A masterpice. @marie…you’re totally right. the mono version is 10 secs shorter since it’s basically running faster than the stereo version. the mono version sounds cuter though hehe while the stereo version sounds and feels just right for the song. Something hat i recently discovered. The mono version IS the original speed of the song. The stereo version is the altered one, the slower and one semitone lower in pitch. This info you can find it on the booklet acompanning ”The Beatles In Mono” box set, but no reason is given. Listning to the original recordings (4 track) the stereo one is the original speed. I always thought the vocals on the stereo version sounded a bit dragging. Not as extreme as Strawberry Fields, but still. The correct mono-version which I heard two days ago for the first time finally sounds right. On the other hand, the slower version sounds a bit more sad and fits the song not that bad. Yeah i have the four track master too, and it’s on the stereo speed, but i don’t know, in the mono box booklet says that it was slowed down on stereo of the original speed that is in mono. I prefer the lower tune of Stereo, but there’s some sadness also on mono. The mono version sounds like chipmunks on a drug trip. The Beatles were in a phase where they liked speeding things up during remix, just as much as they liked slowing them down. For instance, When I’m 64 on the same album is speeded up, and The Fool On the Hill later featured a speeded-up vocal (over normal instruments). It is most plausible that the stereo mix retains the original speed and key (E) of the performances, the more so if that is what the 4-track says, and that the mono was speeded up during remix. Which to call “correct” is another question, essentially a religious argument. As much as I enjoy the song, it does have a lyrical gaffe which I always took to be McCartney’s. Fun can absolutely be bought with money. (“Fun was the one thing that money can’t buy”) Love, maybe not so much. True enough, money probably can buy fun. A more accurate sentiment would have been “Love is the one thing that money can’t buy” but we already learned that back in ’64. I had exactly the same reaction the first time I heard this song. In my case, I thought immediately of being taken to an amusement park and having lots of fun—paid for by my parents! $ = fun, right? But when I heard John sing, “Fun is the one thing that money can’t buy,” I asked myself whether it really was the money that made me enjoy myself. Obviously the money was necessary: you couldn’t ride the rides without tickets, and tickets cost money. But I realized that the money was not sufficient: I later went to the same amusement park, rode the same rides, and had no fun at all. Why? My parents had recently gotten divorced. $ can buy you enjoyable things, but actually enjoying them isn’t something that $ alone can provide. Maybe “fun” in the song is intended as “happiness”.. Excellent observation about a line that always bothered me too. No no no, this is typical Lennonesque irony: he’s puncturing the sentimentality by tossing in something obviously, comically false. But it also intensifies the sadness: fun isn’t really fulfilling if it’s just bought. Just my opinion, but I read it on a deeper level. When you’re unhappy, you can easily become depressed. Depression can be like a zombie walk through life that has become existence. You can be with someone at a “fun” event, but feel pain or nothing at all instead of fun. You need to feel from the inside what the outside is presenting to you. You can be at a great party or an amusement park, and feel absolutely lonely and miserable. I imagine the girl in the song is isolated with her parents. She probably couldn’t relate well to kids her own age. She was sheltered and, when her parents saw her withdrawing, maybe they took her to events that were supposed to be “fun” and would have been if only she had company who could unlock the joy inside her. I see a forlorn soul, going through the motions of the rides all alone, with her sad parents standing near trees, looking on and not knowing what to do or how to help her in any way. All three are joyless, and it’s sad because so many people in life feel that way. I’m an oldie and I fortunately have the 2 versions on vinyl (original ODEON POPS black label in Argentina 1967 mono & the stereo mix of 1980s). The speed is exactly the same in both cases. But it changed when EMI reedited all the band’s catalogue on CD. The 2009 remastered version has the same length as the CD of that period (1980s)but it really sounds different. By the way what would you say about John’s vocals? Only vocals, background vocals or lead vocals? In my opinion he sings background. I’ve always found this song dragging and dreary, although the counterpoint vocals, the complexity of the melody and the orchestral arrangement are to be admired. Then I heard the mono version – which, incidentally, is the actual speed/key in which the song was recorded – and it suddenly made sense. I can even say I like it now – rather than just admiring its musicality of the piece. I could agree more. The mono version is really nice. The song no longer drags. George Martin was very critical of the orchestral arrangement – of course because he didn’t do it. Sour grapes! The arrangement is a thing of beauty. This is one of my favorite Beatles songs. The mood, the lyrics, Paul and John’s vocals, and the musical resolution at the end with the harp. Was surprised to find Martin didn’t do the arrangement. It certainly doesn’t suffer from it. I’m actually just hearing the mono version for the first time now.. I’ ve fallin in love with the CD remastered version the speed gives it a certain atmosphere that I think fits the song. I think I like it better tho the mono version is still great. The song was recorded deliberately at a slower speed and in a lower key, with the intention of speeding the tape up on playback. This was to “brighten up” the sound of the instruments and vocals. That was what happened in the Mono version, but when mixing the Stereo version (with The Beatles absent) the tape was not speeded up as originally intended. No-one seems to know why this happened but it means that it is the faster Mono version which The Beatles intended to put out. George Martin was biased towards Paul – John and George knew that and never worked with him again after the split – and spoke a lot of crap half the time like saying in one doco I saw recently Paul was mainly interested in the music while John in the words which is blatantly untrue. He wouldn’t have known who wrote what precisely and wasn’t even involved in the recording of “She’s Leaving Home” was he? It’s great that Paul gave credit to John for co-writing the song.When I hear it – like today hence this post- I now think of it as a McCartney-Lennon song with John as co-lead singer. I like Paul more when he shows his generous side instead of trying to claim everything. Mind you Lennon gave George Martin a serve on a few occasions. He told him he didn’t want any of his “production crap” on the Get Back album and GM said he was vicious to him and everybody in the RS interview 1970. So there were some issues there. This is one of a number of songs from this album written by Paul that nonetheless feature a prominent John vocal section (I’m thinkig of “Sgt. Pepper” the opening track and “Getting Better”). At one time I thought these sections were written by John. Ian MacDonald in “Revolution in the Head” refers to the middle of this song (which he described as the “sour” middle I seem to remember) of this songs as being contributed by John. But I guess his contribution was limited to a few of the lyrics of the song? Yeah, basically what John sings is what he contributed: the perspective of the runaway girl’s parents. But just the lyrics, right? By contrast, I noticed in the “Getting Better” article that Paul credited John with writing a “counter-melody” in that one. Not so in this one, I suppose? I can’t believe 40-50 years later so many are still pitting John and Paul against each other. Competition would be natural for the two greatest songwriters of any generation. It never ceases to amaze me that so many people feel the need to fight Johns battles, they both did a pretty good job on their own and still loved each other to the end. It’s The Beatles and everything they did was great. In the seven years together the four of them accomplished more than 20 bands combined couldn’t dream of doing in a lifetime. Enjoy the music and hit next on your ipod, cd player if you don’t like a song or feel the need to critique every aspect of a song because millions and millions didn’t seem to have a problem. I can only imagine what Beethoven had to put up with. I was staggered by the beauty of this song the first time I heard it. Pure poetry. Very nice to hear the 2017 deluxe version without the vocals, similar to the remix of Eleanor Rigby. Those two songs together elevated the Beatles to a level rarely reached by pop artists by gaining undeniable legitimacy among even the greatest snobs found in classical music circles. An absolutely beautiful sad song. It is interesting to imagine what the arrangement might have been like had George Martin handled the piece. The young Miss Coe bears quite a resemblance to Pattie Boyd. Lennon wrote a lot of this song remembering words aunt Mamie had told him. This is certainly a beautiful song, it was Paul’s idea and the whole feel of it is Paul but the little lines that Lennon wrote are quite mesmerizing it gives Paul’s song depth, so many Beatles songs have that and I believe this is the Beatles secret. Some of John’s songs have that as well, that’s why they were so unique as a band.